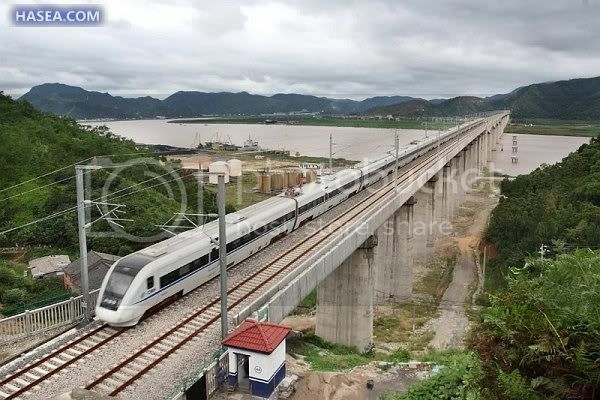 At least 11 people are dead and another 89 rushed to hospital after two coaches of a bullet train fell off a bridge after derailing in east China's Zhejiang Province late Saturday' date=' local fire fighting sources said. Witnesses said one of the coaches had fallen to ground, while the other one was hanging in the air. No matter the opinion on Chinese HSR, this is obviously a tragic moment. That shouldn't be able to happen. Why was the train behind still moving if the track ahead was blocked? There's obviously something very wrong there. Possibly failure of the ATC/ATS system, but even with power failure, a proper fail safe system would have signals go red, or dark(? ), which would tell the the driver to brake immediately. Since the first train was stopped by a lightning strike, it's likely that the surge went through it and into the tracks, blowing out part of the sensing system. That should be built to "fail safe", and many older systems still use electromagnetic relays in the track part of the system, which makes them a bit less vulnerable than semiconductors. But as a new system, the Chinese HSR may have had more modern (and less robust) electronics, or just a simpler design because the people building it didn't have the institutional experience of an established railroad to guide them. Plus, the railway has had numerous problems with systems not built to spec, and someone may have replaced a more expensive design with a cheaper-to-build alternative and pocketed the difference. Also, a "dark" signal may equate to "stop, then proceed at a slow speed" depending on the railway's operating rules, which might account for why there were only 11 dead instead of hundreds. The train probably wasn't going at full speed. It's a tragedy either way, but the cause could be operator error by the following train in bypassing a dark signal instead of treating it as red, or going at too high a "slow" speed, rather than a failure of the technology or design. Hopefully the true cause will come out in the accident investigation so they can ensure it doesn't happen again. Also, a "dark" signal may equate to "stop, then proceed at a slow speed" depending on the railway's operating rules, which might account for why there were only 11 dead instead of hundreds. The train probably wasn't going at full speed. Maybe not, but we don't really know yet how many actually died. Right now it's "at least 33", but they're saying there are still many people in the four(!) cars that were knocked off the viaduct by the impact that they haven't been able to get to yet. I don't know much about China's trains but this is supposedly an older design that isn't all that fast. So it still may have been going at a pretty good speed relative to what it does on a normal day, especially if it was a strong enough impact to knock four cars off the viaduct. Not a thing on the evening news here, the death of Amy Winehouse took up most of the news not allocated to the tragedy in Norway. Usually a blacked out signal is regarded as displaying the most restricted aspect that signal is capable of displaying and according to this German site I found http://www.sh1.org/zhongguo/sl.htm red means stop unless it has an additional light authorizing to proceed on sight not exceeding 20 kmh. In any case if it was on a high speed line there likely would have been continuous cab signalling rather than traditional line side signals. If there was a lightning strike it may have affected the signalling system. The one thing that stuck in my mind about Chinese signals after my 2007 trip over there was that their four aspect block signals approaching a red showed respectively green, green/yellow, yellow, then red using normal green/yellow/red three light signals. As soon as I saw it I realised it broke a basic fail safe principle of railway signalling, if the yellow light goes out in that green/yellow it defaults to a less restrictive green and a driver will have one signal less warning of the oncoming red. In our signals, which follow British principles, the green/yellow is yellow/yellow so if one light goes out the signal defaults to a more restrictive aspect. Whatever the case, if the Chinese railway authorities don't get on top of things and find out what went wrong and rectify it, it will hurt their chances of selling there HSR technology to the world. I don't know much about China's trains but this is supposedly an older design that isn't all that fast. From the pictures, it looks like the CRH2 (AKA E2-1000) is the one dangling, and the one still on the bridge is a CRH1 (Bombardier). So the CRH2 rear ended the CRH1..? But yeah, the train that lost all the cars off the viaduct is the one that rear-ended the other one. It looks like it climbed over the top of the stopped train until four of its cars went up and over the side. I'm kind of surprised that I haven't been able to find a single report that actually says what model of trains these really were. I understand not knowing in the initial confusion, but it's a couple days later now. That's pretty basic info; even if the state-run media doesn't want to print it, you'd think some Chinese bloggers or something would have (or maybe they have, and I just don't read enough Chinese blogs). One thing I find disturbing is the report that the wrecked cars were immediately broken up and buried to prevent sensitive information on the technology leaking out. Talk about burying the evidence. Just prepare yourself though... There is a lot of "chest-thumping" and ultra-nationalism every now and then, but there are also some more rational people, as well as railfans interested in Japanese railways. D stands for "dongche" (动车)... It's basically services using 200 to 250 km/h trains. It's a little confusing because some, for whatever reason, are trying to argue this isn't "high-speed rail", even though the trains are foreign HSR models and it's marketed as CRH (和谐号)... Yes, it's not the fastest G-type services like on the Jinghu line, but it's still high-speed rail. I would probably ignore the "150 km/h" (that's probably actual average speed, not maximum speed) being quoted in these articles. D3115, operated with a CRH1B (Bombardier Regina) model, was supposedly disabled by a lightning strike (now they are saying a passenger pulled the emergency stop?). D301, operated with a CRH2B (Kawasaki E2) model, trailed behind and collided with D3115. It appears that they had turned off the train protection system due to the all the recent delays on the Jinghu (Beijing - Shanghai) line. This was likely the direct cause, as the trains were basically running blind. Oh Best China, why you only see your people as just tools instead of your brothers and sisters, like every sensible nation... Oh wait, you aren't a sensible nation, I forgot. IMHO, this symbolises very well how the CPR handles public affairs; just put a lid on it and let it rot. Good job, since things rotting with a lid on it will never explode(!). Gotta cover up everything otherwise someone might be plotting to rebel against the leade... paranoia to the extreme. To really hide the numbers of killed or dying people , I wouldn't be surprised if they did to cover up to state that their accident didn't kill that many people. Has anyone found any news reports confirming this? Whatever else has happened, if this is true, it's a hideous example of irresponsibility. Never doubt the depths of the corrupt and careless bureaucracy culture in China. One factor that brought China to its knees in the first Sino-Japanese war (at the time the supposed Asian super power vs tiny pirate island nation) was that the leaders continued to embezzle the money meant for ammunition through the entire war (and that was only the tip of iceberg). The Communists didn't create government corruption and bureaucratic indifference in China, they just streamlined what was already there. The first reports said only two cars fell off the viaduct, and that's what it looked like in the pictures. But then they said it was actually four cars, and if you look closely at some of the pictures, you can see that two other cars had either pancaked or been sliced right through, so that the walls had just completely separated from the cars. So the death toll sounds suspiciously low to me. And with them burying the cars, we will never really know if the official death toll is correct or not. It's actually counter-productive burying the cars, because now no one will believe anything the government says about this accident. I would probably ignore the "150 km/h" (that's probably actual average speed, not maximum speed) being quoted in these articles. It 's fitted with sleeper cabins onboard and the weird out of place lights.. Very unusual..
Never doubt the depths of the corrupt and careless bureaucracy culture in China. I don't doubt it for a moment. But if there's documentation of a decision to disable the train protection systems, that needs to get around. That's from some "analysis" of the accident floating around on Chinese message boards. I don't believe there's been an official announcement regarding the cause yet, and even if there was something official from the MOR, I'm sure you could be certain that you weren't being told the whole truth. Immediately tearing apart the cab car reeks of an attempt to destroy damning evidence. The manufacturer of the signalling system says that it was "free of malfunctions" at the time of the accident, which would *seem* to throw a wrench in the theory that the lightning somehow damaged the signalling system, although cannot say for sure. For sure, though, is that the Beijing‒Shanghai line that opened to much fanfare less than a month ago is having A LOT of problems. They had another three-hour service disruption today after a power failure in Anhui Province. If the signalling system was malfunctioning the evening of the accident, it's not difficult to imagine some top official at the Shanghai Railway Bureau, already getting heat for all the delays on one of China's most prominent public works projects, throwing orders out to disable the system. Of course there are other possible factors being cited, like lack of coordination between the various railway bureaus and poor driver training (apparently, only 10 days to become a train driver).